The Geneva Discussions resulted in steps towards gradual normalization of the situation on the ground said Bolat Nurgaliyev, the Special Representative of the OSCE Chairperson-in-Office, following a meeting in Geneva today. 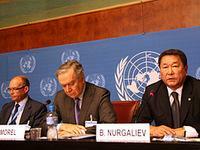 Nurgaliyev and the other two Co-Chairs of the Geneva Discussions, Pierre Morel of the EU and Antti Turunen of the UN noted progress has been achieved during 2010. "The unilateral commitment by the President of Georgia formalized in official letters addressed to five international organizations and the President of the United States, should be seen as a major step in the right direction. Formal reactions from Tskhinvali and Sukhumi testify to this," said Nurgaliyev. "Another positive development was the resumption of the Dvani/Ergneti Incident Prevention and Response Mechanism." Urging the participants to continue efforts in a constructive approach Nurgaliyev reminded of the Commemorative Declaration "Towards a Security Community", adopted by the 56 OSCE participating States at the Astana Summit which says: "Increased efforts should be made to resolve existing conflicts in the OSCE area in a peaceful and negotiated manner, within agreed formats, fully respecting the norms and principles of international law enshrined in the United Nations Charter, as well as the Helsinki Final Act. New crises must be prevented. We pledge to refrain from the threat or use of force in any manner inconsistent with the purposes and principles of the Charter of the United Nations or with the ten Principles of the Helsinki Final Act." In welcoming significant steps to resolve the supply of basic utilities to the affected communities, Nurgaliyev said: "Providing gas and water will make a real difference to the quality of life for the affected people. I am happy that the OSCE can contribute concretely to these important matters." The Co-Chairs and the participants welcomed Giedrius Cekuolis who will be Lithuanian Special Representative for Protracted Conflicts during his country's OSCE Chairmanship next year. The discussions took place in two parallel working groups. One group dealing with security and stability and the other with humanitarian questions, including internally displaced persons and refugees. The next meeting will be in Geneva on 4 March 2011.